Die exklusive Villa El Messidor, mit eigenem Pool und Klimaanlage, großem Garten und tropischen Pflanzen, liegt angenehm neben dem Puerto Banus und in der 2. Reihe zum Strand im schicken Wohngebiet La Pepina / Azalea. Es ist nur 60 m vom Strand entfernt und in Gehweite zu Hotels, Bars, Restaurants und einem Supermarkt. Puerto Banus mit seinen Restaurants und Nachtleben ist innerhalb von 10/15 Minuten zu Fuß und die angenehme, weiß getünchten andalusischen Stadt San Pedro ist nur 3 Autominuten entfernt. Mehrere Golfplätze liegen nur wenige Autominuten entfernt. Großes en-suite Badezimmer mit extra Dusche zum Schlafzimmer. En-suite Badezimmer zu einem der Zweibettzimmer. Weiteres Badezimmer. Hinweise zur Unterkunft: Die Villa hat 350m2 Gebäude mit einem Land / Garten von 1000m2. Es bietet Platz für 8/10 Gäste in 4 geräumigen Schlafzimmern. Zusätzliche Kinderbetten sind ebenfalls verfügbar. Haustiere nicht erlaubt. Draußen: Großer, L-förmiger, beleuchteter Pool, eingebauter Grill, beleuchtete Terrassen und Gartenmöbel. Reinigung / Handtücher / Bettwäsche / Reinigung: Wöchentlicher Wäschewechsel, zweimal wöchentliche Reinigung und regelmäßige Garten- / Poolpflege sind vorhanden. Be careful before booking. We booked ten days arriving Sunday 28 August. Despite receiving lots of email confirmations of this from the owner, he double booked us with another holiday maker. We did not find this out until arrival when there was no one to meet us at the villa. The owner's agent did not answer the mobile number we were given, and only spoke Spanish. So could not communicate with anyone. After eventually continually ringing the owner, he eventually rang back. No apology, just repeating that he had our arrival as 29 August - and we were looking at his confirmation and all our emails in front of us clearly stating our flight details and arrival time! The owner runs several villas in Spain so we were moved to another sub-standard villa for the night which hadn't even been cleaned. Very stressful start to our holiday with two grandchildren under the age of three. The villa El Messidor when we eventually got to it was ok. The pool and garden were excellent. Kitchen needs a serious upgrade and actual equipment supplying. Hardly anything in it, we really struggled for equipment to cook with. No shelves in the oven either... No iron in the villa so we had to google translate and send a message to the agent. The furnishings have seen better days, and only one small towel each supplied, which were so dirty after a couple of days as we had to double up and use as pool towels, we washed them ourselves eventually. No welcome pack on arrival either. Apart from the good weather, the whole experience was not worth the high rate the owner charges. I would not recommend anyone book this villa as you will be disappointed for the money. We asked for one night refund for the double booking the owner made on the first night, but he ignored our emails and messages. To this date, we have had no apology or response. First of all the reviewer changed their arrival time at the villa several times during the reservation process. Despite of not informing us of their latest arrival time our representative was able to provide them with the first class service. The reviewer indicates that on arrival at the villa “ the owner’s agent did not answer the Mobil number we were given, and only spoke Spanish” One should ask if the agent did not answer his phone, how the reviewer knew that he only spoke Spanish? As a matter of fact our representative is multi-lingual. The reviewer stated that only one towel was provided per person is totally inaccurate. 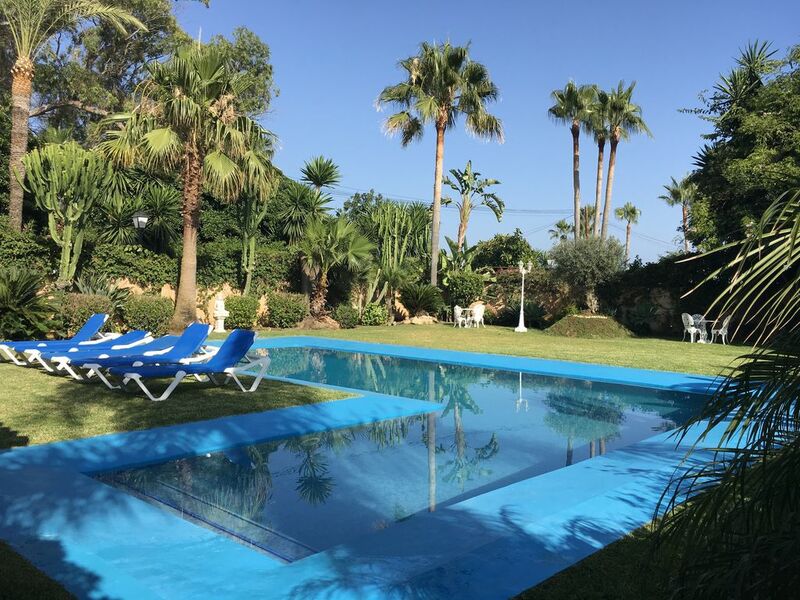 The villa accommodates 8 guests thus 8 large and 8 smaller towels are provided upon arrival, and the towels are changed and the villa, garden and swimming pool are fully cleaned twice a week (in the middle of the week and also in the weekend). Moreover, our representative and cleaning crew are always available 24 hours to provide the guests with additional services such as extra towels, additional accessories, and other services on requests. Furthermore, we have specifically, requested the guests not to use the house towels as pool towels apparently; the guests have also ignored our request. The reviewer indicated that there was not an Iron in the Villa which is absolutely incorrect, they just did not bother to take time and look in the closet or ask our representative. May I inform you that in the past 15 years we have provided first class accommodation in the exclusive villas and in an exceptional location next to the Puerto Banus, and within 100 meters to the beach and boulevard (Passeo Maritimo) having many satisfied guests which are returning year after year. Thank you. This is an older property so don't expect perfection - some storage units and bathroom fittings are a little 'cranky'. In our opinion, the beds were on the hard side and we would have liked additional pillows (take your own!). Apart from these minor quibbles THIS VILLA IS PERFECT for lots of reasons. 1) LOCATION: It is rare to find a proper villa completely walled and private in this 'apartment dominated' location. Fantastic restaurants are within a close level walk (Try Sea Bass baked in salt between two at Nuevo Reino) as are the beaches, and Puerto Banus is a 20-25 minute stroll along the beachfront. 2) GENERAL AMBIENCE: The pictures are an accurate portrayal - the garden is now more mature, and the pool is excellent (Very deep at the far end, and shallow - good for kids - closer to the shaded patio). 3) FUNCTIONAL: All the important things work: aircon in all bedrooms, fridge, barbeque, DVD, Satellite TV etc. 4) SERVICE: What really impressed here is the quality of service and support provided locally by Gerlinde and her team. The cleaning and maintenance is excellent and we were treated with great courtesy. 5) PROVISIONS: It was nice too that the villa was well supplied with things like barbeque charcoal, condiments, dishwasher tablets, towels, linen, pool toys, loungers and so on - meaning we did not have to buy anything but the food we ate. All in all - highly recommended and in our opinion good value, operated by genuine people. Die Villa befindet sich nur 5 Minuten zu Fuß vom CoCo Beach und Mistral (kein Stress) Strand in Puerto Banus, und ihren jeweiligen Erholungs- und Sporteinrichtungen. Die Wassersportanlagen von Kala-Kalua (mit Jetski, Tretbooten, Para-Segeln und Bananenbooten) und die schönen Strände von San Pedro und die Palmenpromenade sind in 5 Minuten zu Fuß in einer anderen Richtung zu erreichen. 40 Minuten nach Malaga und Gibraltar Flughäfen. Die 2 bekanntesten Fischrestaurants in ganz Marbella (Nueve Reino und Alabardero), an der San Pedro Promenade, sind nur einen kurzen Fußweg entfernt. In der Nähe befinden sich zahlreiche historisch interessante Orte. Granada mit seinem Alhambra Palast und Gärten ist ca. 1,5 Stunden Fahrt entfernt. Die Altstadt von Ronda ist in 45 Autominuten erreichbar. Gibraltar ist innerhalb von 1 Stunde Fahrt. Die Costa del Sol ist mit ihren ausgezeichneten Marinas und unschätzbaren Liegeplätzen an der Spitze Europas, zu denen Puerto Banus, Marbella, Estepona, Duguesa usw. gehören. Es gibt eine Reihe von Tennisclubs sowie viele ausgezeichnete Gesundheits- und Fitnesszentren in der Gegend von Marbella. Puerto Banus: Seit seiner Gründung vor rund 40 Jahren ist dieser Hafen stetig gewachsen und verfügt heute über ein Casino, ein kommerzielles Einkaufszentrum, ein Kaufhaus von Corte Ingles, ein Meeresobservatorium und ein Multi-Kino mit Filmen in Original-Soundtrack. Das Nachtleben pulsiert in Puerto Banus mit einer Auswahl an Alfresco-Bars, Piano-Clubs und Diskotheken. Tagsüber ist dies der Traum eines jeden Shoppers. Von der zentralen Promenade aus können Sie regelmäßig Bootstouren unternehmen. Dies ist der Ort, an dem Sie sich verwöhnen lassen und die fabelhaften Luxusyachten bestaunen können. Die Umgebung ist nahezu ideal mit seiner beeindruckenden Bergkulisse und dem Meerblick. Marbella: Was früher nur ein kleines andalusisches Fischerdorf war, hat sich in einen der aufregendsten Ferienorte an der Mittelmeerküste verwandelt, einer der Lieblingsplätze der Reichen und Schönen und all derer, die es gerne wären. Dieses Zentrum des Jet-Set und Showbusiness bietet wunderschöne Boulevards, Parks und Gärten, sowie die romantischen engen Gassen in der besten maurischen oder andalusischen Tradition, die Marbella zu unverwechselbarer Persönlichkeit machen. Mit seinen großartigen Stränden, dem großartigen Klima und einem einzigartigen Angebot an Sport, Gastronomie und Unterhaltung ... ist ein Besuch in Marbella ein Garant für unvergessliche, exklusive Ferien. The final Cleaning is 250 Euro. The Security Deposit is 500 Euro.